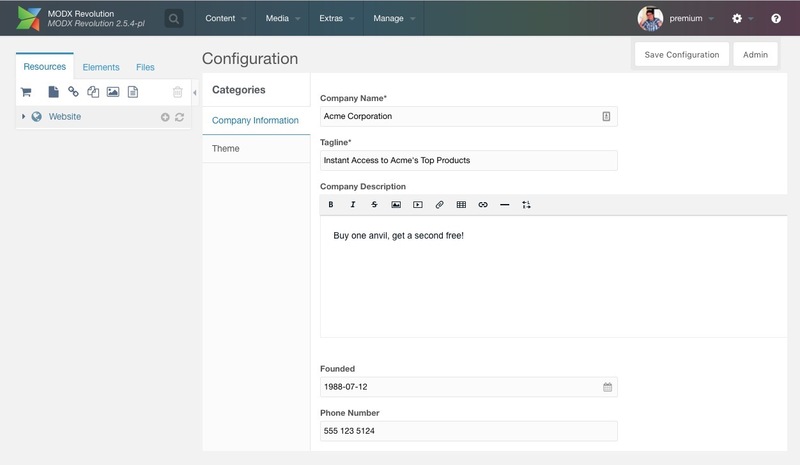 ClientConfig gives your client a user-friendly interface for making site wide changes, while you as the administrator set up the different options available to the end-user. If you're looking for any particular screenshots not included here, or if you have any other questions, be sure to let us know by getting in touch with support. The client view, here shown with the horizontal view, shows the various settings you configured, spread across two groups. The theme tab showing the colorpicker and image selector. The vertical tabs view can be enabled with the clientconfig.vertical_tabs setting. Theme tab in the vertical view. The admin panel of ClientConfig allows you to manage the settings and groups available to the client. The grid is inline-editing enabled for quick tweaks. Showing some of the options. Depending on the selected field type you may get different fields, like a media source or field options box. ClientConfig comes with the ability to import and export both groups and settings, so you can easily copy them from one installation to the next.